FILE - Guest speakers find the seats onstage at the start of an event held in recognition of the 25th anniversary of the space shuttle Challenger’s launch and celebration of Christa McAuliffe’s life and legacy at the McAuliffe-Shepard Discovery Center in Concord, N.H., Jan. 28, 2011. Christa McAuliffe's lost lessons are finally getting taught in space. Thirty-two years after the Challenger disaster, a pair of teachers-turned-astronauts will pay tribute to McAuliffe by carrying out her science classes on the International Space Station. As NASA's first designated teacher in space, McAuliffe was going to experiment with fluids and demonstrate Newton's laws of motion for schoolchildren. She never made it to orbit: She and six crewmates were killed during liftoff of space shuttle Challenger on Jan. 28, 1986. 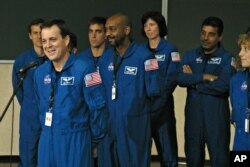 Astronauts Joe Acaba and Ricky Arnold will perform some of McAuliffe's lessons over the next several months. Acaba planned to share the news during a TV linkup Friday with students at her alma mater, Framingham State University near Boston. FILE - The International Space Station (ISS) crew members Joe Acaba, right, of the the U.S., and Alexander Misurkin of Russia walk after donning space suits shortly before their launch at the Baikonur Cosmodrome, Kazakhstan, Sept. 13, 2017. Four lessons — on effervescence or bubbles, chromatography, liquids and Newton's laws — will be filmed by Acaba and Arnold, then posted online by the Challenger Center, a not-for-profit organization supporting science, technology, engineering and math education. The center's president, Lance Bush, said he's thrilled "to bring Christa's lessons to life." "We are honored to have the opportunity to complete Christa's lessons and share them with students and teachers around the world," Bush said in a statement. NASA's associate administrator for education, Mike Kincaid, said the lessons are "an incredible way to honor and remember" McAuliffe as well as the entire Challenger crew. Four of the six lessons that McAuliffe planned to videotape during her space flight will be done. A few will be altered to take advantage of what's available aboard the space station. FILE - Ricky Arnold, left, speaks after being sworn in during a ceremony inside the old Apollo Mission Control room at Johnson Space Center in Houston, Texas, June 14, 2004. Acaba returns to Earth at the end of February. Arnold flies up in March. NASA is billing their back-to-back missions as "A Year of Education on Station." The two were teaching middle school math and science on opposite sides of the world — Acaba in Florida and Arnold in Romania — when NASA picked them as educator-astronauts in 2004. The idea to complete McAuliffe's lesson plans came about last year. "As former teachers, Ricky and Joe wanted to honor Christa McAuliffe," said Challenger Center spokeswoman Lisa Vernal. McAuliffe was teaching history, law and economics at Concord High School in New Hampshire when she was selected as the primary candidate for NASA's teacher-in-space project in 1985. Her backup, Barbara Morgan, is on the Challenger Center's board of directors. Morgan was NASA's first educator-astronaut, flying on shuttle Endeavour in 2007 and helping to build the space station.